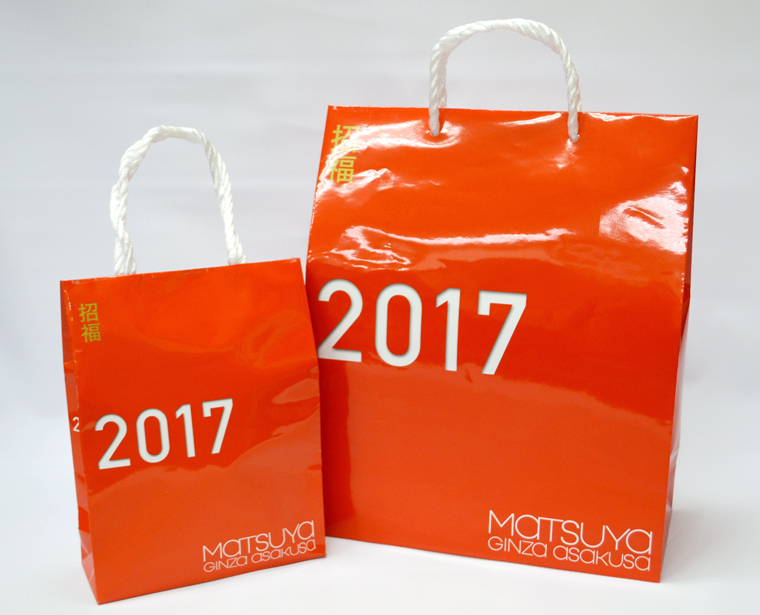 Lucky bags are a feature of the beginning of a new year in Japan. A lucky bag is a sealed package containing many goods, with the bag offered for sale at a lower price than the total value of the goods in it. They have been very popular among Japanese people as New Year merchandise. 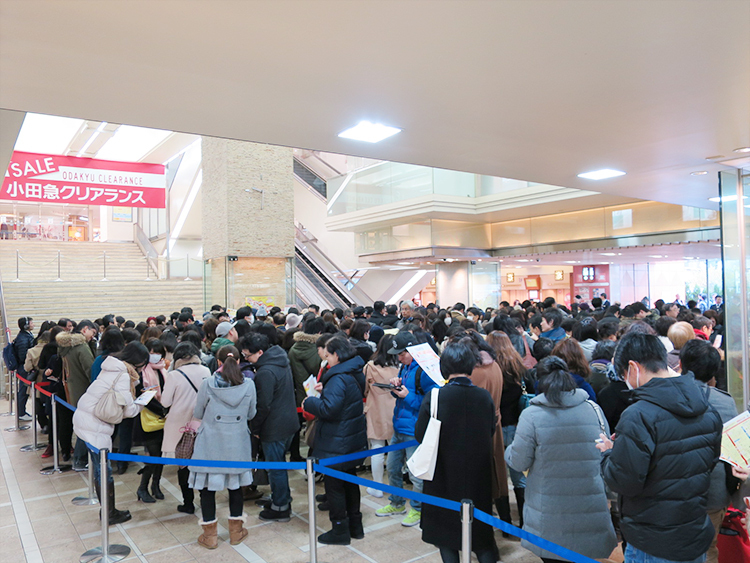 From the morning, long lines of shoppers fill department stores on New Year's Day every year to purchase lucky bags. Over the past few years, lucky bags have evolved, and they now contain products that cannot be packed into a bag, such as travel services or even a car. The tradition of lucky bags is said to have begun in the 1910s, when major department stores sold limited quantities of grab bags containing goods that normally cost two to three times as much as the price of the bag. Since the bags were sealed, shoppers did not know what was inside a bag until someone bought and opened it. They offered the element of surprise, and as merchandise with such appeal, lucky bags rose in popularity. The sales areas in stores in those days sold lots of them quickly. 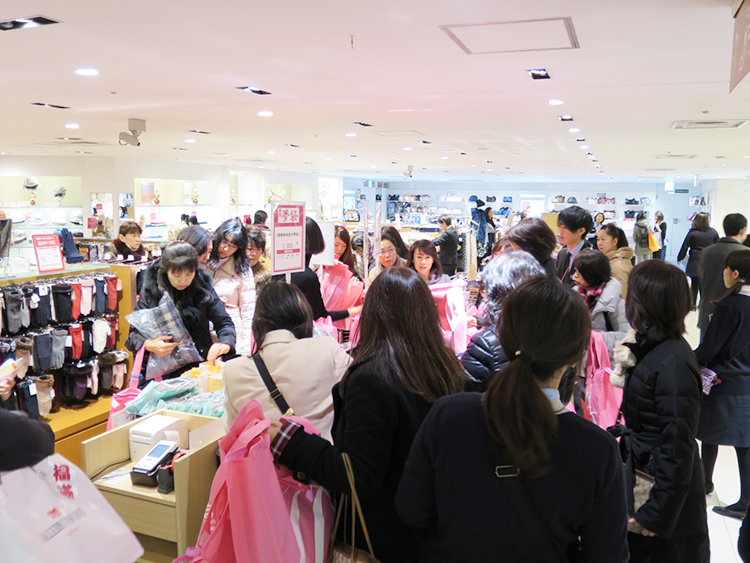 After several years, the sales areas grew so crowded that some department stores temporarily stopped selling lucky bags. A recent trend seen in the lucky bags sold at high-end department stores is the preference for assortments of high-quality, practical goods. For example, a department store once filled a lucky bag of men's brand name clothing with five pairs of socks, five dress shirts, five ties and more. The price of all the items was at least five to seven times the price of the lucky bag itself. 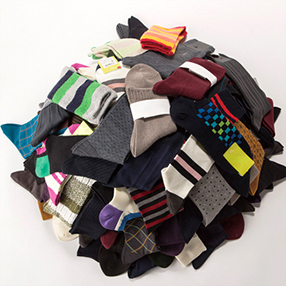 In other cases, a department store prepared a lucky bag containing 30 dress shirts for the smart-looking businessman who wants to wear a different shirt for each day in a month, and a lucky bag containing more than 100 pairs of socks for the woman who enjoys sharing with family and friends. In the stores, shoppers may occasionally be seen sharing and trading the contents of the bags they have just bought there. Sometimes, prepared foods and goods in Japan are offered with three rankings, matsu (pine), take (bamboo) and ume (Japanese apricot tree), depending on their quality. Generally speaking, the rankings of pine, bamboo and apricot tree are said to usually show merchandise from most to least expensive, in this order. The three are all symbols for good luck in Japan, which may be the reason why the rankings are often used for New Year's lucky bags. 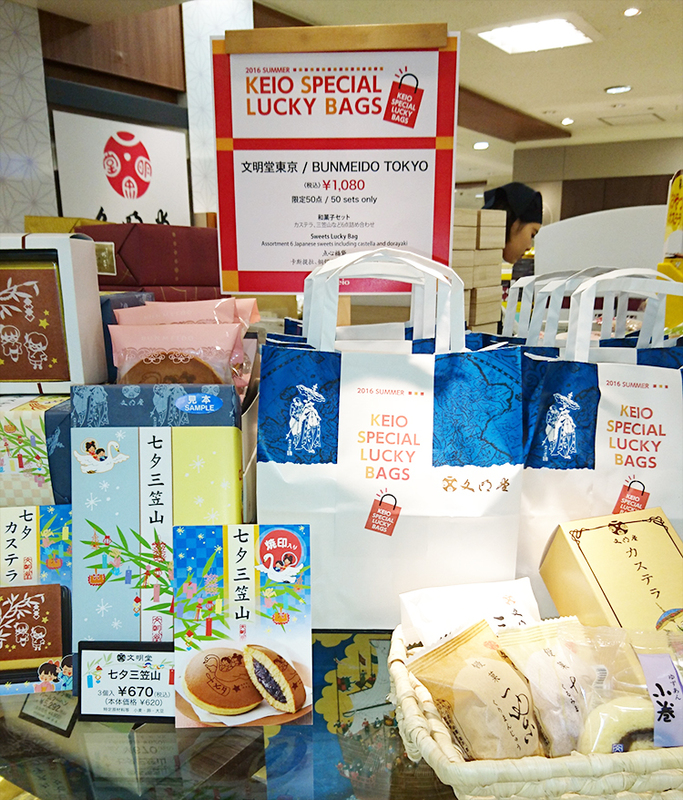 Nowadays, some foreign tourists visit Japan with the aim of purchasing lucky bags. So stores also sell lucky bags containing items popular among shoppers from outside Japan. These bags are offered during not only the New Year's holiday season but also the summer holiday season. You might say that lucky bags in Japan now draw the attention of people all over the world. Some lucky bags sold in recent years contained not tangible objects but rather experiences for purchasers to enjoy. In 2002, a major department store sold a lucky bag that offered the experience of being a stationmaster for one day. 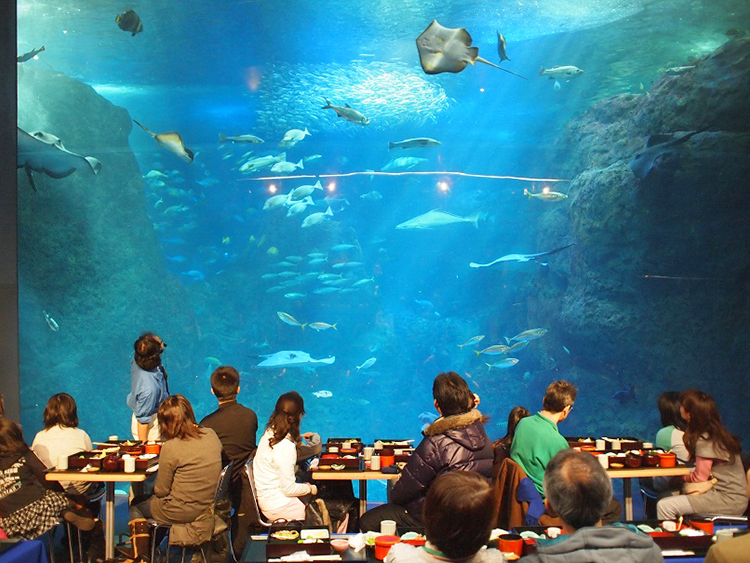 It triggered a wave of other lucky bags that sold special experiences not possible to most people in everyday life, such as the experience of rice planting or being a fashion model. As lucky bags have evolved to where they are today, you can say the changes are significant. Not only do they offer experiences that purchasers can enjoy, but also their contents are already revealed before purchase. As the buyer who won the "Odakyu Railway Dream Bag - One Day as a Stationmaster," one young boy is getting the experience of being a stationmaster. The changes are not limited to lucky bags of intangibles. Unusual lucky bags of material goods have appeared, offering tangible products such as a rhinoceros beetle, home renovations and the latest model of car from a major automobile manufacturer. In addition, various lucky bags aimed at foreign tourists have also been offered. 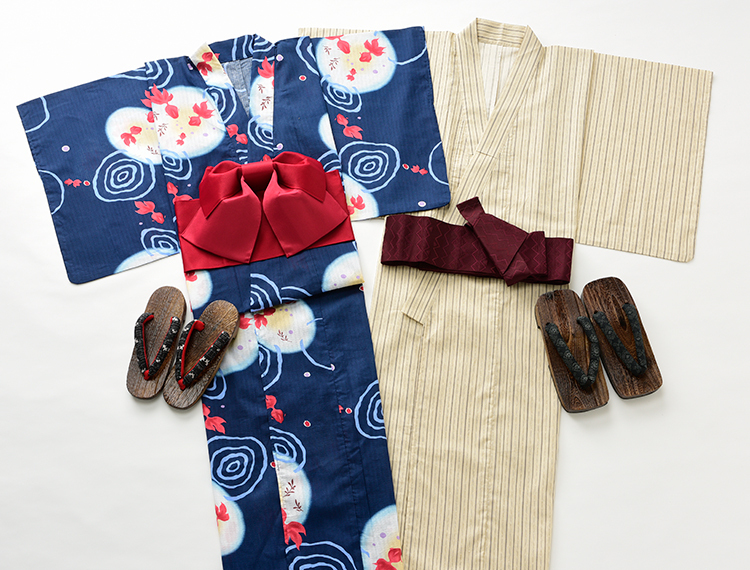 One example is an integrated lucky bag that combines material goods with experiences, by providing a yukata set, the experience of being dressed in the yukata and portrait services. Another example is a lucky bag offering a guided tour of shrines and temples. The rising number of unorthodox lucky bags may be due to Japanese people's spirit of service to meet the various needs of consumers and the productive power of ideas in the background. As such, lucky bags will continue to evolve in their own way, bringing liveliness and cheer to the shopping scene in Japan.